SAN FRANCISCO (KGO) -- More details are emerging about the bones of a child found in planter boxes in San Francisco's Alamo Square neighborhood. Some are wondering if those remains could help solve a cold case that has haunted police for decades. ABC7 News spoke to a retired San Francisco homicide inspector who hopes this tragic discovery will help solve a long-running murder mystery. Police are waiting for lab results, but the burning question is the identity of the child, whose bones were found in planter boxes outside two adjacent apartment buildings, and how old the bones are. Those questions are really important to cold case detectives who also hope for some answers. After hearing about this recent discovery, retired San Francisco homicide inspector Joe Toomey told ABC7 News, "Maybe it's just a natural death and they just buried the child." 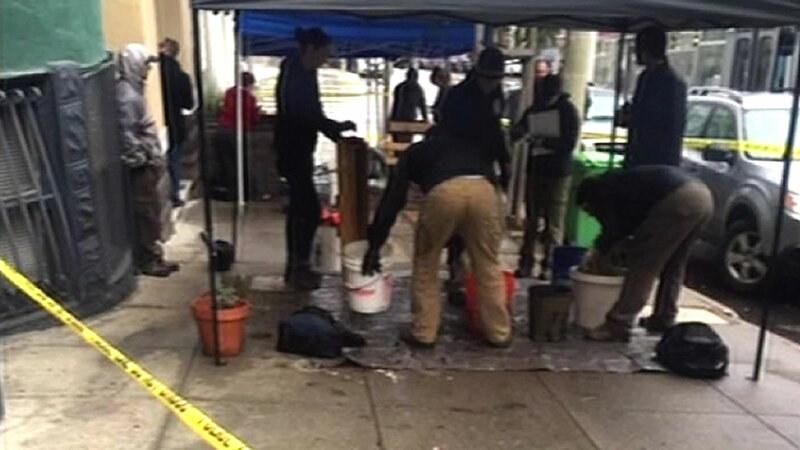 The first bone was found in a planter box outside an apartment house on McAllister Street and the second bone was found in a planter box next door. The disturbing discovery was made last month. To find out more about how a resident found the child's bone and what led to the discovery of a second bone click here or view the video below. San Francisco police have made a disturbing discovery at two apartment buildings in San Francisco's Alamo Square District, just down the street from the city's iconic Painted Ladies. Resident Natasha Koscak told ABC7 News she saw one of the bones. She explained, "The piece that I saw was like a section, what looked like a jawbone, and the teeth definitely seemed similar to the molars." Police put up the crime tape to preserve not only the planter boxes, but the dirt around the building. Anthropologists set up tents where they sifted through dirt, wondering if there were other body parts. Toomey says the last time he can remember a similar police operation was two years ago in a house about a mile away in the Haight-Ashbury neighborhood. That is when investigators tore up the basement floor when cadaver dogs located bones in a house once occupied by a person of interest in the disappearance of Kevin Collins -- the 10-year-old boy who has been missing since 1984. However, the bones found turned out to be from an animal. This latest discovery brings Toomey back to that cold case. He said, "The only case that I know of, of a child that is unsolved and the child's body has not been found is Kevin Collins in San Francisco. So when something like this happens... I mean, you have to think that way."